For anyone considering to move all branches of their svn repository, this is what the KDE guys came up with: http://gitorious.org/svn2git/ It's an awesome tool to rewrite all weird branches using a ruleset. Since the branches of a svn repository can be stored anywhere, with artibary roots, such tool is invaluable for migrating huge repositories. Kudos on getting this done through all the technological (and political) hurdles. Your analogy of Github to Rome is spot-on - thanks for making it. Also, congratulations for just doing it and worrying about the archival branches later (i.e. Getting Things Done). As you say, the SVN repository is still there. It's not like historians don't have to read more than one book to get the history of something - it seems totally fine to keep the SVN repo for posterity rather than be fastidious about bringing along every old branch into the current repo. I predict that this will be viewed as a milestone in the Django community and a step-function increase in productivity will be the result. The analogy of Github to Rome is nonsense! If "If I'd lived in Roman times, I'd have lived in Rome. Where else? ", why someone would choose Django? RAILS was Rome and probably still is!!! ... but I when switching from Java choose Django (even before the 1.0 release) because it was a Python Framework! IMHO, Bitbucket would be a better choice! They use Django! and are long time supporters! With Bitbucket git could also be used... but I again think that Hg would be a better choice: Easier!, better windows support (I' a Mac user, but this a point to consider!) and its made with PYTHON. This is what we've been waiting for a long time. I don't know if Github is the right place for the django project - but GIT is for sure the right choice from my point of view. That's not a difference that I think the core team could ignore. i think can implement a Jira with github integration changing the trac. Jira is very powerfull and workflow enabled. That way, you get a 'bare' repository with all the server branches as local branches. Trac can read the contents of that repository. In a cronjob, you can run a 'git fetch' to keep the repository up to date. @Diederik: I know, but you can also do GitHub service hook and call to Trac on every push to GitHub, to sync the local git repository. I have made a similar plugin (link in my previous post) for Bitbucket&Mercurial. I would like to know what is this technological solution Jacob has been working on because I could maybe help. Thanks for posting your adventure in detail! It's nice to see you talk about doing a migration over again, and why, because I've done that. All of them required test runs and second runs. Testing with subsets has also been useful. It's important to remember as a community that, after initial analysis, the pattern of ((try, fail, fix) repeat) is a valuable tool in software development, way faster than analysis paralysis. It allows us to have GitHub repository and push there and work there, but still use Trac for ticketing and wiki. Last month I set up a system and when I cloned django from git I got version 1.4. 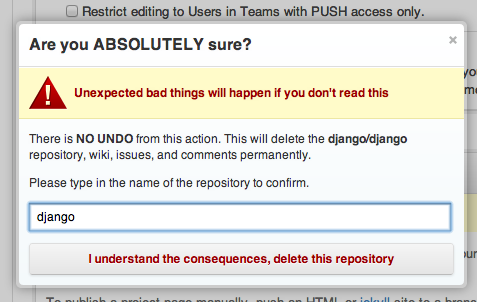 Now I an setting up another system, and when I clone django from git I get 1.5, and my app is failing. How I can get 1.4? I see a django-nonrel / django-1.4 but it says "Work in progress 1.4 port, DON'T USE"
This is awesome man, I think we can go forward faster because GitHub pull requests. I have to highly aaulppd the WebFaction team for getting this working and making it available to their users. I have been trying with great difficulty to get this working on my own VPS till a friend (and WebFaction customer) told me to take a look here the timing was almost perfect as I had been dealing with this on and off for over three months and was despairing. This combination of Trac and Git alone is prompting me to seriously investigate migrating all my hosting to WebFaction. Well done WF! Your image http://www.holovaty.com/images/2012-04-28github2.png is a broken link (404).